We are one of the leading trader of GPS Tracking Device for Automobile Industry. Our offered range are widely demanded in the automobile industry as our products are designed and tested by a team of experts. GPS - Vehicle tracking, Fleet Management, School bus Tracking. We Provide GPS tracking service for your fleet. we use quality products and services to help you manage your fleet. We have to expertise to provde solutions that are apt and just right for your requiremnt. Wetrack2.0 is Waterproof Vehicle GPS Tracker can be used as a great tracking devices for our vehicles. 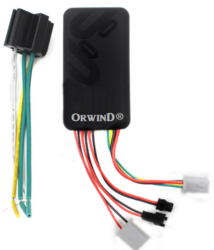 This can be easily carried installed and used for tracking vehicles in real-time and monitoring using smartphone. ARAI approve device as per the Govt norms. We engage in delivering a quality range of Automotive GPS. These products are sourced from trustworthy vendors, who ensure to develop these products in strict compliance with the set industry standards and norms. Being a most reliable organization, we are engaged in offering a wide range of Automobile GPS Tracker.
. Real time tracking, Driving history playback, Report, Geo-Fence, Mlultiple alarms.